Here in the Heartland, people need their cattle and pigs, and you’re the one to give them what they want. You and your rig, that is. So load the crates, keep moving, and deliver the goods in exchange for sweet, sweet ca$h. Just another day at the Great Heartland Hauling Co. 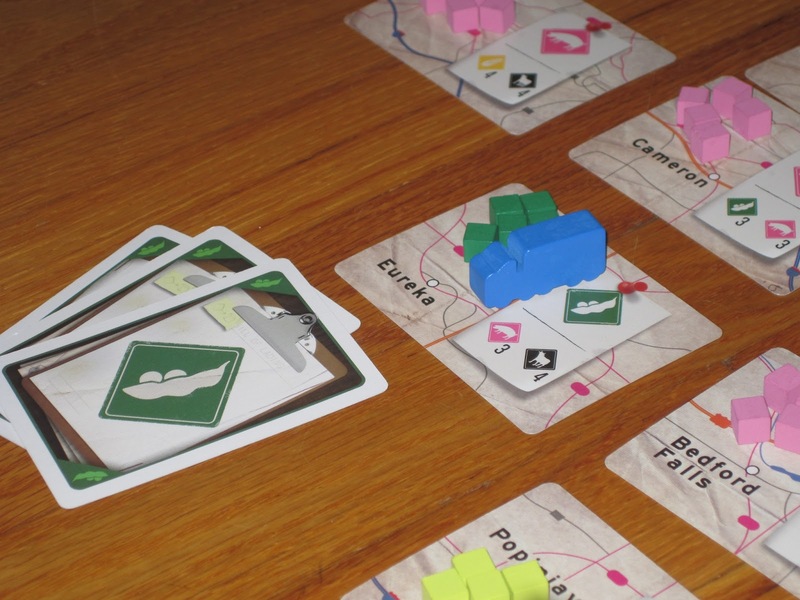 The Great Heartland Hauling Co. is a pick-up-and-deliver economic game for two to four players. Players compete to load and distribute goods using their trucks in order to make the most cash. 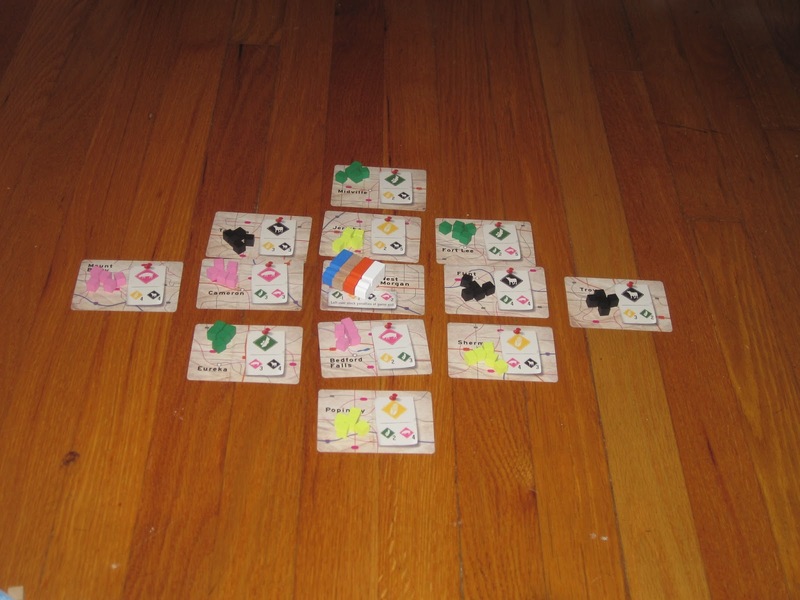 At the start of the game, the city cards are shuffled and placed in a predetermined layout. Each city card has a native good (what that city supplies) and two nonnative goods (which represent the demand in the city). Each city card receives five cubes that match its native good. 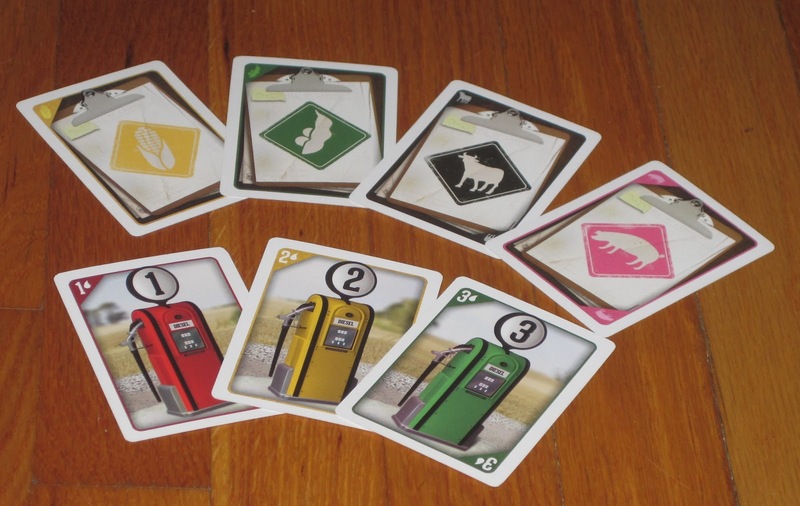 Each player receives a truck score card with a matching truck meeple, $5 (marked on the card), and a hand of five cards. The “board” set up for four players. Players must move their trucks each turn. 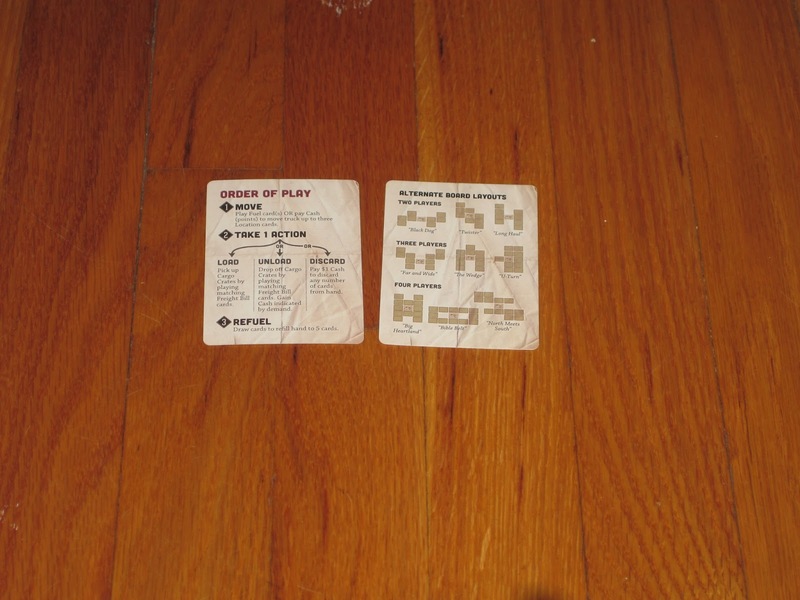 Players may use gas cards or cash (but not both) and may move up to three spaces (orthogonally). Next, players must take one action. Actions are either loading goods of a single type (by discarding freight bills of a matching color), unloading goods of a single type for ca$h (for the price indicated on the current city, again by discarding freight bills of a matching color), or discarding (paying $1 to discard as many cards as desired). Finally, players must “refuel,” refilling their hands to five cards from either the face-up supply or the draw stack (or a combination of both). The game ends once one player reaches the end-game scoring amount. The other players have one more turn, players lose cash for any goods still on their trucks, and the player with the most money wins. Truckin’ Along, or Out of Gas? 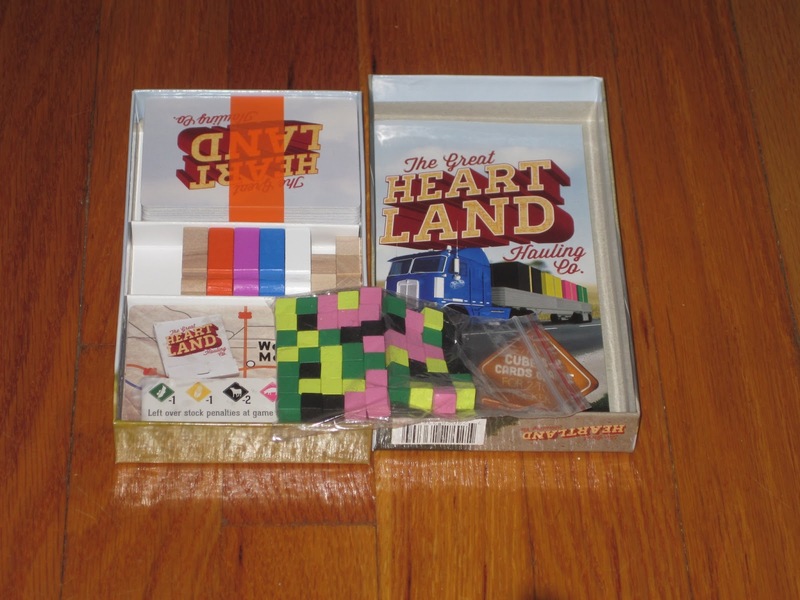 The Great Heartland Hauling Co. is a small-box game that is big on components. The game is one of the best I’ve seen in terms of game to box ratio, and it’s full of opportunities for players to experiment and find their own favorite way to play. The gameplay is smooth, familiar, and (mostly) intuitive. Yet for all these things in its favor and the many reasons why I know the game will have its fans, The Great Heartland Hauling Co. is not a game I enjoy. Dice Hate Me Games got the look of this game just right, and the cards are intuitive and easy to read. But before I say why it’s not for me, I’ll talk about what’s good about the game, starting with the box and the value. Opening the lid for the first time is a little overwhelming, just because Dice Hate Me Games has found a way to pack so much stuff into a tiny box. (The box, by the way, is the same size as their earlier Monkey release, Carnival.) 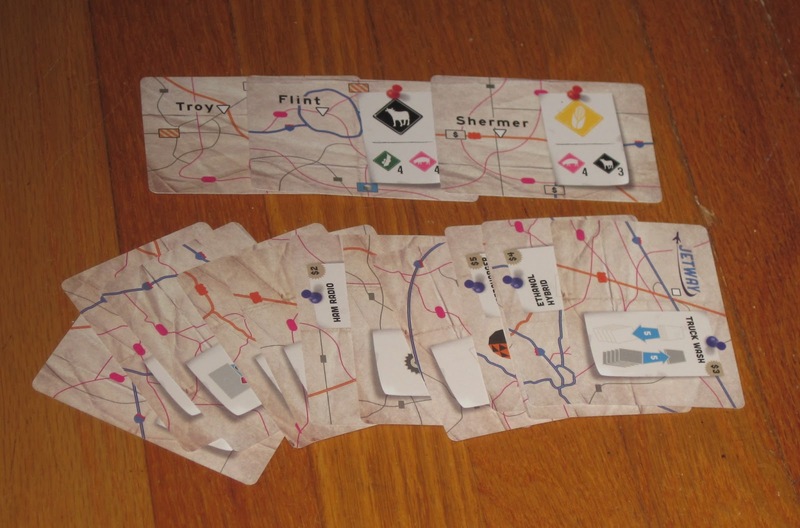 The box contains the freight bills, gas cards, city cards, and truck cards, as well as the cards that make up the game map, the player tokens, goods cubes, an expansion, and several variants. (Kickstarter backers received another expansion, which also fits inside the box.) Shelf space is at a premium in my household, so the prospect of a small-box game that has this much packed inside is attractive. The theme for The Great Heartland Hauling Co. is fairly novel. Going along with this, The Great Heartland Hauling Co. (perhaps in response to Carnival’s not having a start player determiner) has the best method I’ve read for choosing who goes first: “The player with either (A) the best mustache, or (B) the longest hair goes first. If one player has a very nice mustache and the other player has the longest hair, settle the issue with an arm wrestling match.” Classy and awesome…and this also means I never go first. Regarding the theme, a coworker did point out that he had trouble remembering the rules because of certain hiccups in the theme. For example, truck routes in real life are usually all about efficiency–picking up goods near where your deliveries are to save money on gas. The fact that a player can perform only one action per location before being forced to move on seemed to him a needless limitation (and, indeed, we had to remind him several times that, no, he could only perform one action). I told you: there’s a lot packed into a tiny box. The components for The Great Heartland Hauling Co. are excellent, for the most part. The card design is clear, and it’s easy to tell at a glance which freight bill is which, whether by color or symbol, even at a distance. The cardstock is excellent, which was a surprise (most games I’ve played that were funded on Kickstarter don’t pay much attention to cardstock, even if all the other components are good). These cards are easy to shuffle, have a linen finish, and seem like they’ll hold up for a while. 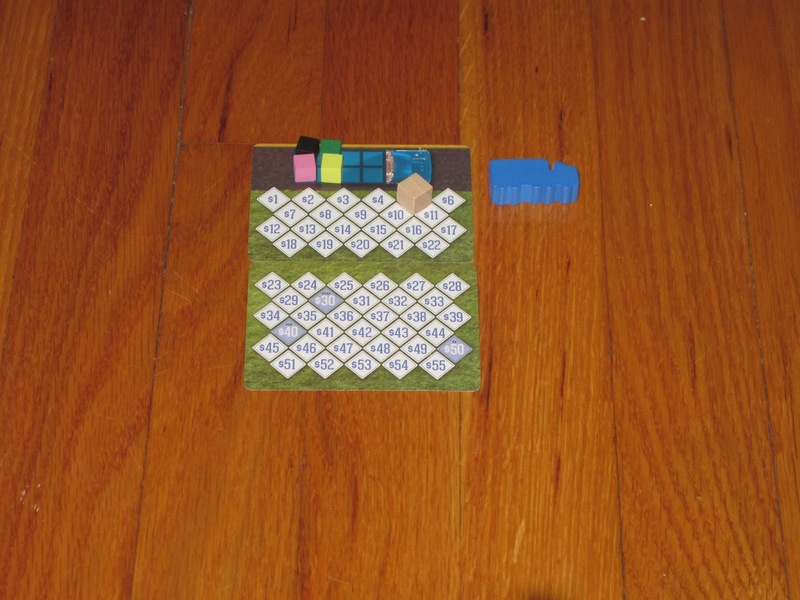 The truck meeples are chunky and cool to use in the game. The two complaints I have about components are nitpicky. First, the small cubes that represent corn are not yellow but neon green. I didn’t think this would be a big deal–process of elimination would lead us to believe that those cubes represent corn–but each time I gave the cubes to another player to distribute at the start of the game, they asked, “What about these green cubes?” Similarly, in each game I played, the other players asked a few times what the demand numbers meant on the bottom of the city cards (even after I explained). I think it would have been clearer to put a dollar sign in front of the numbers to show that the number represents cash. But while it isn’t immediately clear at the outset, it becomes so soon enough. Neither of these is a huge deal. The gameplay in Great Heartland Hauling Co. flows well, and I like the clearly structured turns. Similar to Ticket to Ride, each turn consists of a single action (in addition to a mandatory movement), which should keep the game flowing at a decent pace. And indeed, the game works best when player turns don’t take long. I’ve heard many people describe this game as a “filler,” a game that is easily set up, played, and torn down during brief moments of downtime. If this game can be played as a filler, I think that’s probably its niche, though it has not been such for me, with each game lasting in the forty-five-minute range and setup taking several minutes. In that time frame, the game is ten to fifteen minutes longer than I want it to be. The gameplay is clear, but these player aids are still helpful. So despite these positive traits, why is The Great Heartland Hauling Co. not a game I enjoy? For starters, the gameplay decisions don’t seem all that meaningful to me. There isn’t much tension in deciding what to do because no decision seems that much better or worse than any other (at least on an individual turn: over the long haul some decisions will pay off more than others, but you’ll probably have enough time to cash in at some point if you’re paying attention). Because the native goods and goods in demand are fairly evenly distributed, it’s rare that another player’s move will block everything you need to do, and there isn’t much penalty for simply waiting for a more opportune time to do what you need to. Similarly, since trucks must move on every turn, it’s rarely necessary to sell a good for less than the maximum value available (unless the end game is on its way). Because there is no penalty for keeping goods on your truck, you can cart goods around indefinitely until you sell them off at the highest price (and if you have to sell them early, the change in value isn’t much). Because gas cards or cash may be used to move, while it’s a bummer to use cash, you can usually get everywhere you need to go without trouble or worry. Players are somewhat at the mercy of card draws, but with three face-up cards to choose from (similar to Ticket to Ride) and only four kinds of freight bills, I’ve not often found myself fishing for cards. And since hand size is limited to five cards, while you do want to make your hand as good as you can to be able to maximize your turn, even an excellent turn isn’t that much better than a decent one. With each of these, every player is on equal footing since the limitation affects all players equally. All of this points to an “efficiency game,” where the game is in the slight variation of values, and a few dollars here and there matters. That may be true for some groups, but that hasn’t been my experience. The game is forgiving enough and has enough random elements (with the cards) that “efficiency” doesn’t mean much in this context. Despite this, I will say that the “alternate routes” variant addresses what I said about decisions somewhat, making it more difficult to move around without consideration. The weigh station penalizes players with lots of crates on their trucks, and the toll road makes travel cost more. But while these increase the importance of decisions (particularly in moving around), they also increase the playtime significantly since more cash is spent during the game. The truck stops, while also an interesting variation, added time to the game as well, and at least in my trials, didn’t affect the outcome all that much. “Inspansions”–they’re like expansions, but included with the game! Besides the bland decisions, the game also doesn’t feel very interactive to me. It’s true that with a pick-up-and-deliver game, the markets are expected to provide the interaction, and players getting in each other’s way for movement is also something to watch out for. But it’s also entirely possible for each player to find a simple route to run between a few cities to rake in the cash. The problem here is cities that have the native good as one of their demands. Because only eight cubes can be on a card, usually the cubes will pile up in a city, forcing players to move to other cities or spend extra cards (and thus more time) loading nonnative goods. But with cities that have native goods in their demands, it’s easy to fill and then loot a city along the same route (over multiple turns, of course). Other players can interfere, but, as I mentioned above, with the options available being so similar, their interference doesn’t hurt much. For the final reason why the game is not for me, I turn to my coworker. I’ve tried this game with several different groups, all of them on the other side of gateway (not necessarily hobbyists, but they like hobby games), and all of them felt the same way–the game was diverting, but not necessarily one they’d be eager to play again. I asked my coworker why, and he said, “It’s missing that X factor.” That’s what I’m feeling too. I can tell that the game is designed well, gamewise and graphicswise, and it should be a game I’m more enthusiastic about, but it’s missing the excitement of a game I want to play over and over again. The game is by turns either too simple or too long for what it is, and thus it misses catching my interest when it comes time to suggest a game. Each player gets a scorecard, a truck meeple, and a score marker. This is a novel way to keep component size down, and it works well. But I’ve said enough about why the game is not suited to my taste. The game isn’t bad or broken, and it will have its fans. And judging by the many glowing reviews and ratings this game has received, I’m in the minority here. The novel theme will appeal to some. The small box size and bigger-game feel will certainly appeal to those who travel or cart their games around often, and all of the extras in the box will appeal to game tinkerers. Like a Chipotle burrito, this game can be customized to suit each player’s ideal flavor. The base game, without the variants, is super simple and is in line with the better mass-market games. (Seriously, I think Dice Hate Me’s Monkey games would see amazing success on the shelves of Target and other mass-market venues.) I think the base game is a little simple for even the “gateway” moniker, but I think it’d be a good entry point for some, and the variants allow players to make it meatier (though these variations, again, lengthen the game). In short, while I didn’t like The Great Heartland Hauling Co., it’s not a bad game, and I think many people will find a reason to keep on truckin’. But I’d just as soon stay at Dispatch. 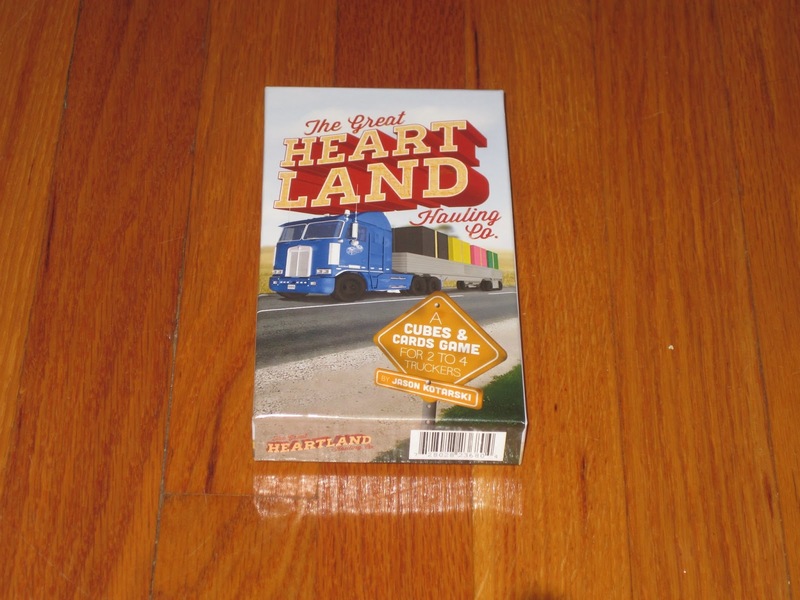 iSlaytheDragon would like to thank Dice Hate Me Games and Game Salute for providing us with a review copy of The Great Heartland Hauling Co.